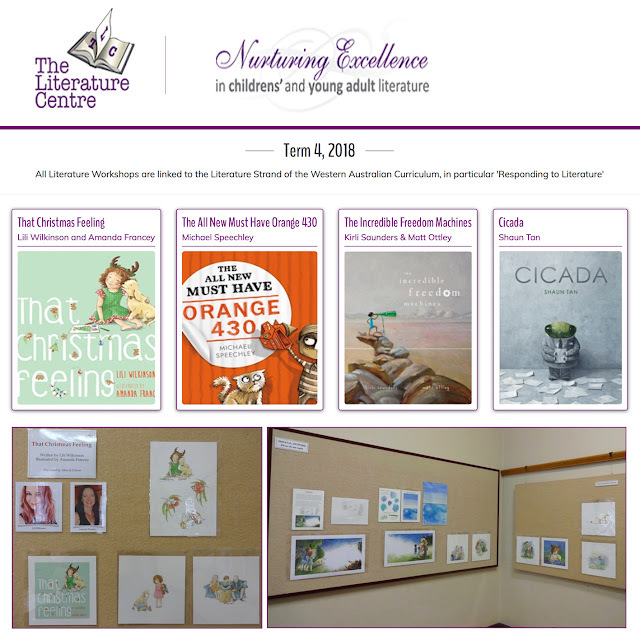 That Christmas Feeling has spread some festive fizz over the walls of The Literacy Centre, Fremantle, this term. If you're over that way, make sure you drop in and see their Term 4, children's book exhibition. 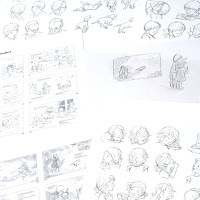 The exhibition showcases my illustration process from beginning to end, including explanation notes on how I illustrated That Christmas Feeling, written by Lili Wilkinson. 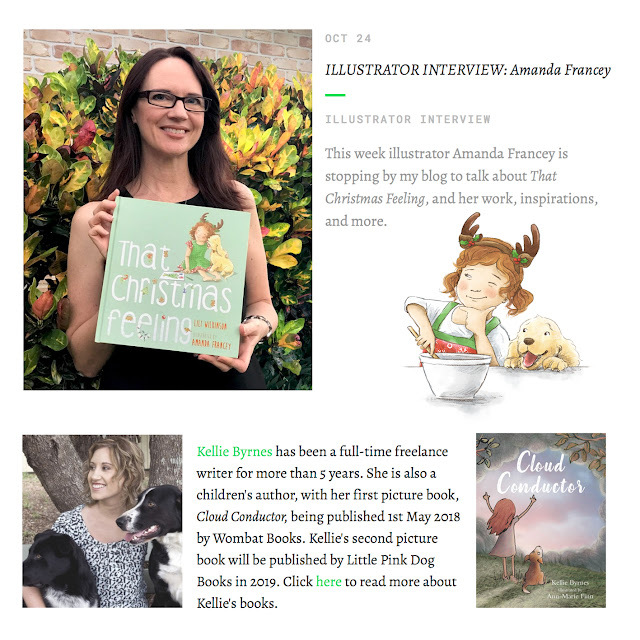 If you're unable to make it to the exhibition, not to worry, as much of my illustration process was covered in Kellie Byrnes' Illustrator Interview with me. the Christmas spirit, and finding it again. 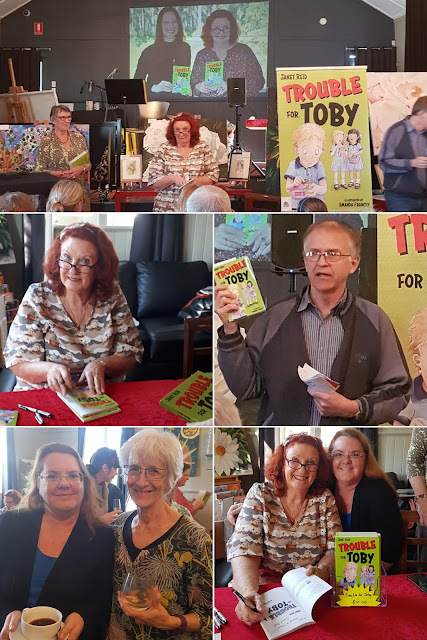 Janet Reid's Launch Party celebrating the release of Trouble for Toby was a great success! Thanks to the friendly staff at The Artist Cafe and Gallery for all of your support on the day. bringing your cameras and capturing the day. “Launches are amazing events. Each one is different, but they all have one thing in common – families supporting family, friends supporting friends, and writers supporting writers. The Trouble for Toby launch was not different with a great mix of all these. I was glad I chose the café option – having the venue prepared and event catered meant it was one less thing for me to worry about and allowed me to enjoy the afternoon. 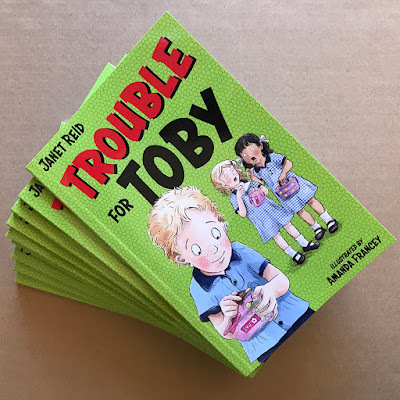 A long-time writing friend, Duncan Richardson, launched the book and spoke about the importance of books like Trouble for Toby, and characters who use their imagination. Then my friend, Margie Riley, to help me with the reading. That worked well and made me less nervous. Unfortunately, I wasn't well enough to attend the launch and help with the children's activities as planned. 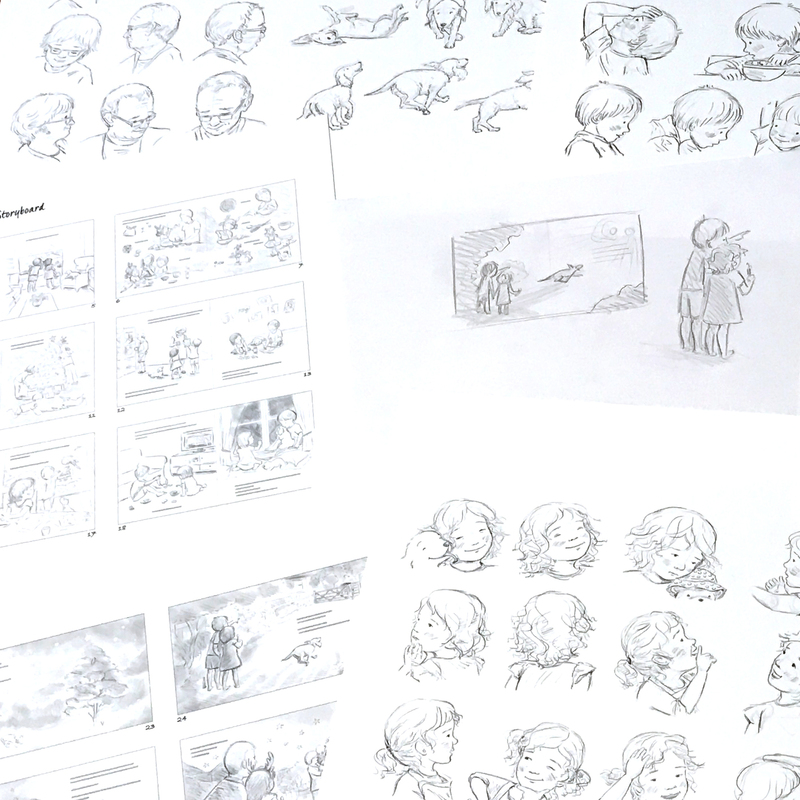 However, I would like to thank my good friend, writer/illustrator Justine Lawson for saving the day. “I had fabulous fun at the Trouble for Toby book launch, helping with the kids making pirate faces and doing word puzzles and colouring. I loved seeing the variety of pirate faces they made from the same basic elements, and the particular relish with which the kids drew the pirates' rotten or missing teeth. "I was inspired by the Australian state school uniforms in general, which haven't changed a great deal since I was at school. 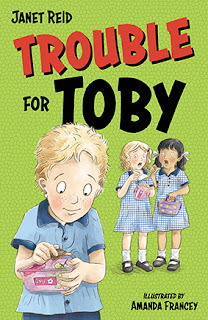 I attended two different primary schools, and the second, I wore blue checkers, much like the uniforms Jenna and Ivy are wearing on the front cover illustration. So I guess, subconsciously, I was inspired by my own school uniform." 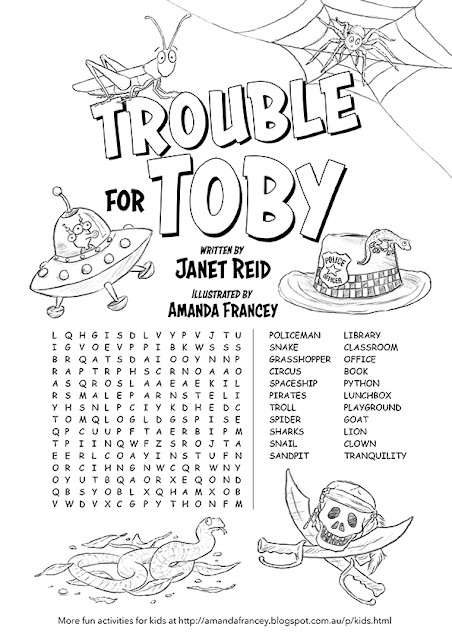 If you missed out on the launch and the children's activities, my illustrated colouring / word search activity is available to download by clicking the image below. 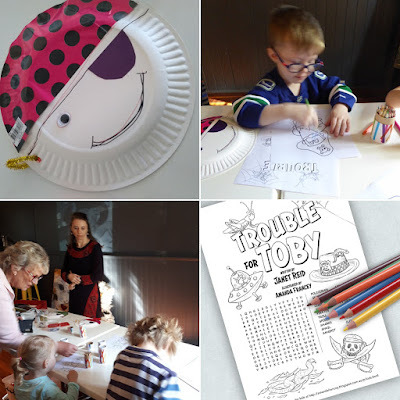 And there are more activities on my Fun Stuff page to keep the children amused over the school holidays. Hopefully, it will give the adult folk enough time to sneak in a quiet cuppa. And maybe some cake. Toby has one mission at school: To stay out of trouble! Only then will his parents let him have a pet. But that's just it, Toby has trouble staying out of trouble. 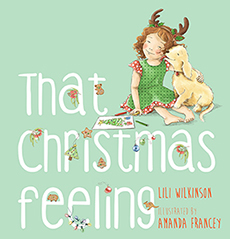 I was thrilled to bits when I realised That Christmas Feeling, written by Lili Wilkinson and illustrated by me, was listed among the CBCA's Book of the Year: Early Childhood notables this year. 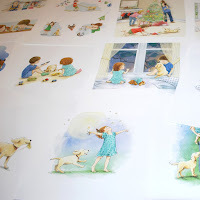 It's such an honour to be grouped with so many amazingly talented authors and illustrators. 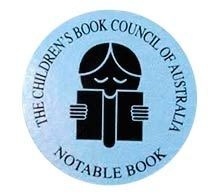 To see the full list, here are the CBCA notables for 2018.
for That Christmas Feeling making the 2018 notables. And it was such an honour to be mentioned alongside Michael Bauer's and Chrissie Krebs' for making the CBCA shortlist with Rodney Loses It. A huge congratulations to both of you! Then click calendar icon top left corner. Trouble For Toby, written by Janet Reid and illustrated by me. 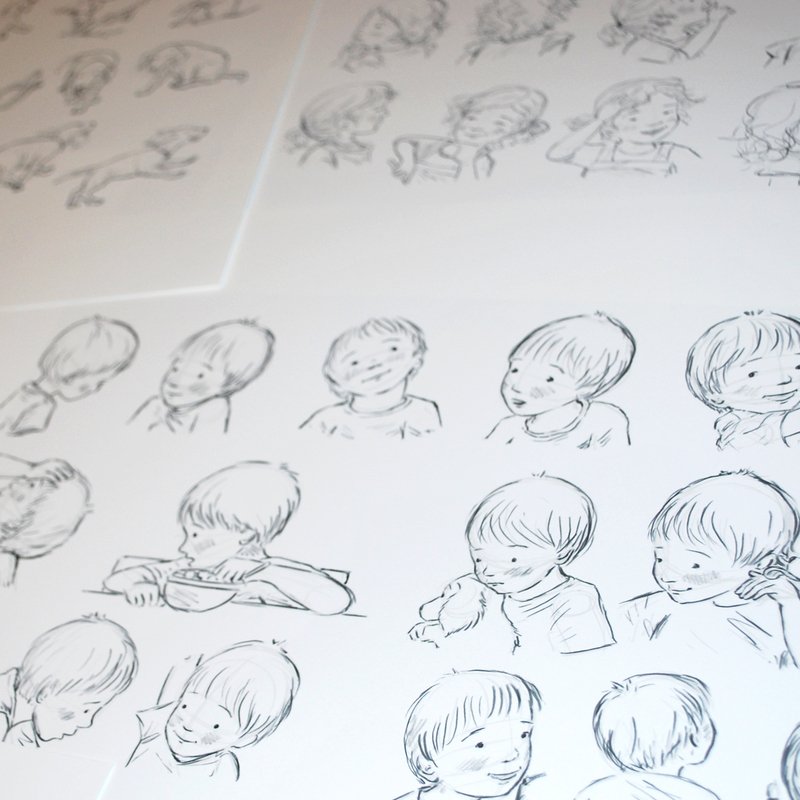 This is the first chapter book I've illustrated and I'm so pleased with how it turned out. Janet's story is brilliant and funny. 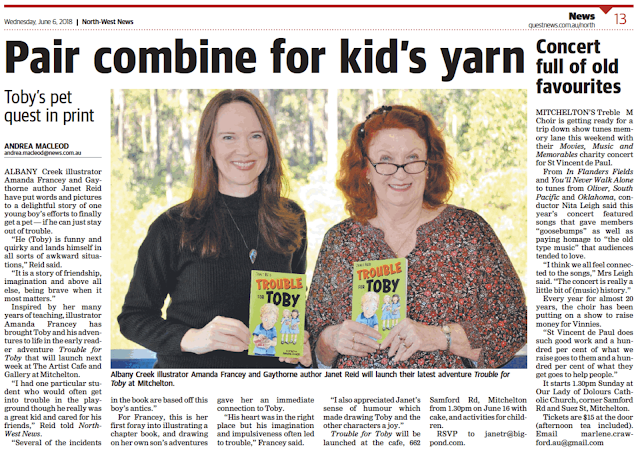 The book was released on the first of this month and published with Wombat Books. 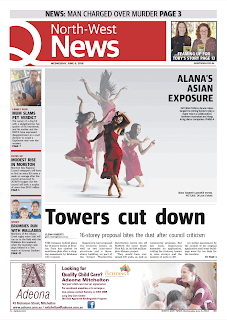 We even made the front page of the North-West News! 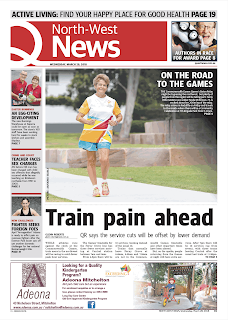 Well, a tiny picture of Janet and I made the front cover. The rest of the story is on page 13. 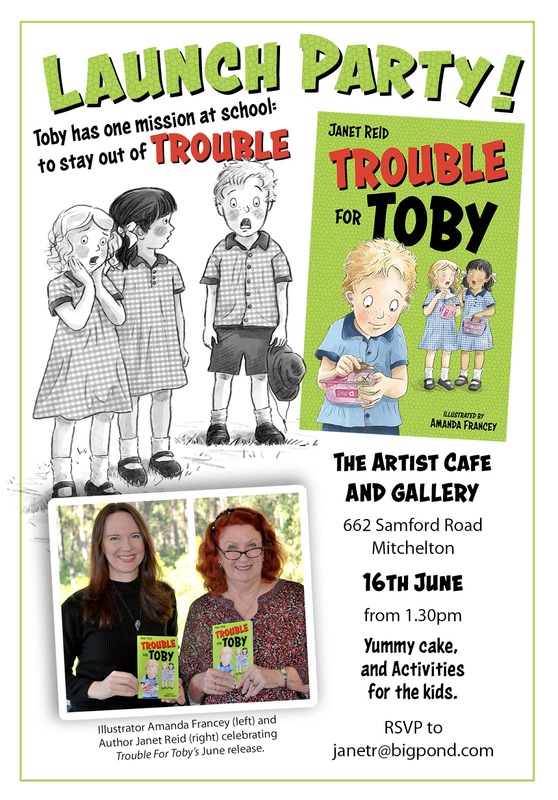 If you're in Brisbane this Saturday, please join Janet Reid in celebrating the release at Trouble For Toby's launch party! 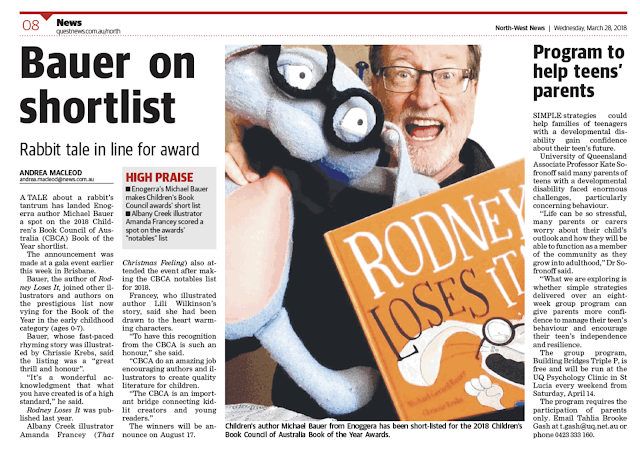 Unfortunately, I won't be able to attend as I've been unwell for some time and need to rest. However, Janet has a fun launch party planned, with cake and a children's activity that I've illustrated. If you're unable to make it to the launch this Saturday, Trouble For Toby is available to purchase below. 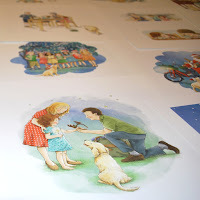 I've uploaded a children's activity with all the other Fun Stuff on my blog for kids. 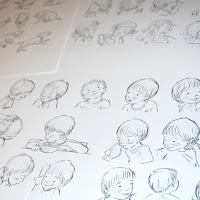 You can view some of my illustrations from this book, from my portfolio.